On the eve of its 21st birthday, Eurostar unveils its very own gin designed by Business Premier Culinary Director, Raymond Blanc OBE, in partnership with artisan producers, Silent Pool Distillers. 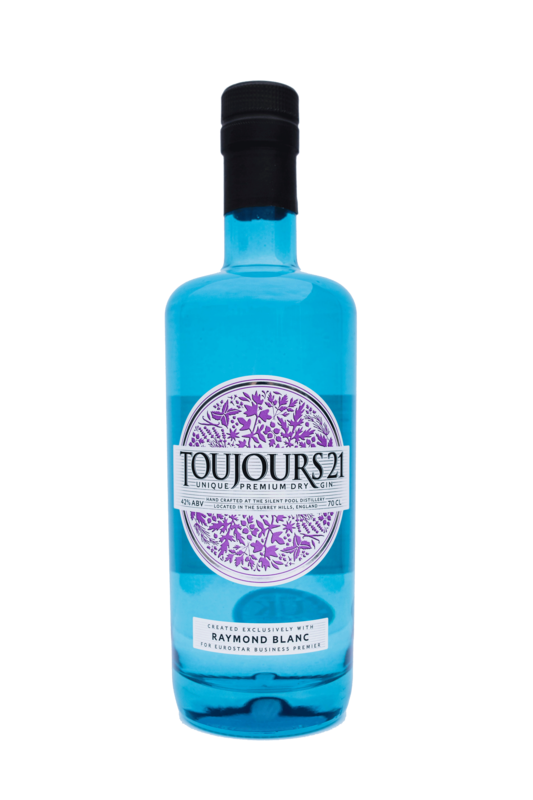 Named Toujours 21, the bespoke gin encapsulates Eurostar’s heritage, reminiscent of both British and French cultures. Composed of a mélange of French botanicals and classic floral scents of the British countryside, the rich juniper flavours and citrus traces are blended with the subtle sweetness of honey, creating a balanced gin that is classic yet unique. Partnering with Silent Pool Distillers was a natural fit, as the craftsmen share Eurostar and Raymond Blanc’s passion for sustainable ingredients of local provenance. Nestled in the heart of the rural Surrey Hills, the team create the gin from the crystal clear spring waters in their very own ‘Silent Pool’. The introduction of the gin marks three years since Eurostar and Raymond Blanc joined forces to transform the on board dining experience for Business Premier passengers. Renowned for his passion and innovative culinary expertise, Raymond works with each of Eurostar’s three kitchens to design seasonal menus combining the best of British and French cuisine. Travellers wishing to preview Toujours 21 may do so in the Eurostar Business Premier lounges in London, Paris and Brussels, where it will be launched as part of the drinks offering. It will then be available to purchase online in the coming weeks. Born in Besançon, France, Raymond Blanc is acknowledged as one of the finest chefs in the world. Entirely self-taught, his exquisite cooking has received tributes from most national and international guides to culinary excellence. At the age of 28, Raymond opened his first restaurant, ‘Les Quat’Saisons’ in Summertown, Oxford. After just one year, the restaurant was named Egon Ronay Restaurant of the Year and was awarded two Michelin Stars. It was in 1984, however, that Raymond fulfilled a personal vision, creating a hotel and restaurant in harmony when he opened ‘Le Manoir aux Quat’Saisons’ in Great Milton, Oxfordshire. Celebrating its 30th birthday this year, Le Manoir combines magnificent surroundings with gastronomic excellence. It is the only UK country house hotel to have retained two Michelin stars for the past 30 years. In 1991, Raymond established ‘The Raymond Blanc Cookery School’, welcoming enthusiastic amateurs and professional cooks, as well as children, to the kitchen. The school provides the opportunity for students to develop their skills while learning some of Raymond’s own kitchen secrets. In 1996, Raymond opened his first brasserie in Oxford. His vision was to be the best within the brasserie scene in England, serving good quality, freshly prepared, seasonal food at accessible prices. Brasserie Blanc now has some 20 brasseries throughout the UK including 7 London locations. Raymond is a best-selling author, and his BBC2 television series have included such programmes as The Very Hungry Frenchman, Kitchen Secrets and How to Cook Well. He is currently filming a new television series with the BBC and Kew Gardens, titled Kew on a Plate, which is due for broadcast in 2015. He is also writing two books. An acknowledged advocate of sustainability, Raymond is Honorary President of the Sustainable Restaurant Association (SRA), a not-for-profit organisation championing sustainability within the industry. The Distillery is located 5 miles east of Guildford in Surrey next to the spring fed Silent Pool. 2014 was spent building the site and installing the bespoke 350L Holstein still, tanks and reclaimed English boiler that burns sustainable local hardwood to produce the steam for the still. The distilling licences were granted in October 2014 so the business is a little over a year old, in that time they’ve launched a number of products including the multi award winning Silent Pool Gin. The team specialise in short run bespoke products of high quality where their unique production processes add a unique twist, everything is produced onsite and nothing leaves the site unless it’s in a bottle. They recently responded to the bumper English fruit harvest by fermenting and distilling local fruit into a range of Apricot, Plum, Pear and Quince Eau de Vie’s and they created English summer fruit Strawberry and Blackberry Alcoholic Gin Cordials. They have a number of other small run gins and will be launching vodka before Christmas.